Thomas Woodrow Wilson narrowly won re-election as 28th president of the United States, campaigning on the slogan, “He kept us out of war!” Within a few months, American troops would be heading for Europe after all. Mack Sennett’s Keystone Kops were making millions laugh in the nation’s movie houses, while New York’s Wally Pipp was home-run king in baseball’s American League. The year was 1916, and America was a nation in ferment. It was a time of transition: from horse and buggy to horseless carriage … farms to cities … domestic tranquility to foreign entanglement … peace to war. Major change was taking place in U.S. coinage, too. Within the previous decade, exciting new designs had debuted on six different U.S. coins, supplanting the serene, sedate 19th-century portraits that preceded them. And now, in 1916, three more old-style coinsthe Barber silver coinswere heading for the sidelines as well. Outside artists not on the staff at the U.S. Mint had furnished new designs for the six previous changes, and Mint Director Robert W. Woolley showed his satisfaction by going outside again. In 1915, he invited three noted sculptors, Hermon A. MacNeil, Albin Polasek and Adolph A. Weinman, all of New York Cityto prepare designs for the three silver coins, apparently with the intention of awarding a different coin to each artist. The Mint may not have planned it this way, but Weinman ended up getting two of the three coins, the dime and half dollar, with MacNeil getting the quarter and Polasek being shut out. It’s hard to imagine how Polasek or anyone else could have improved on the winning entries, though, for all three of the new coinsthe Mercury dime, Standing Liberty quarter and Walking Liberty half dollarare magnificent coinage artworks. A.A. Weinman was born in Germany but came to the United States at the age of 10 in 1880. He honed his skills as a student of the famed Augustus Saint-Gaudens, and by 1915 he was widely acclaimed as one of the nation’s finest sculptors. For the obverse of his design, Weinman chose a full-length figure of Liberty striding toward the dawn of a new day, clad in the Stars and Stripes and carrying branches of laurel and oak symbolizing civil and military glory. The reverse depicts a majestic eagle perched on a mountain crag, wings unfolded in a pose suggesting power, with a sapling of mountain pinesymbolic of Americaspringing from a rift in the rock. These strongly patriotic themes resonated perfectly across a nation then preparing (knowingly or not) to enter World War I, ironically against the land of Weinman’s birth. Weinman placed his initials (AW) directly under the eagle’s tailfeathers. First-year coins from the branch mints in Denver and San Francisco carry the “D” or “S” mintmark on the obverse, below IN GOD WE TRUST, as do some pieces minted the following year. Partway through production in 1917, the mintmarks’ location was moved to the lower left of the reverse, just below the sapling, and that’s where it remained until the series ended in 1947. 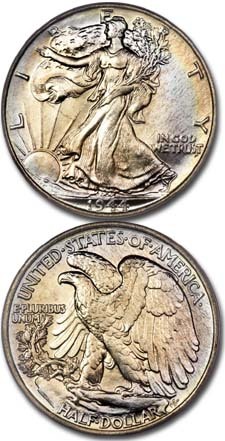 Over 485 million Walking Liberty halves were made between 1916 and 1947, but they were issued only sporadically during the 1920s and early 1930s, none being minted in 1922, 1924-26 and 1930-32. These were coins with substantial buying power, enough to buy a loaf of bread, a quart of milk and a dozen eggs in the early `30s, so it didn’t take huge quantities to fill Americans’ needs, especially after the Wall Street crash plunged the nation into the Great Depression. 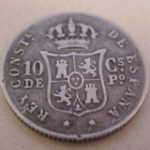 Mintages were particularly low in 1921, and the P, D and S half dollars from that year all rank among the major keys of the series. Other scarce issues include the 1916, 1916-S, 1917-D and S with the mintmarks on the obverse and 1938-D. 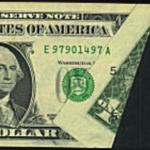 Brilliant proofs were minted from 1936 to 1942, totaling 74,400 pieces, and a very few satin-finish proofs were struck in 1916 and `17. “Walkers,” as they’re frequently called, are large precious-metal coins with a much-admired design. As a result, they hold great appeal not only for traditional hobbyists but also for non-collectors. Many exist in grades up to Mint State-65. Even above that level, significant numbers exist for certain dates, particularly the later years. Most dates, however, come weakly struck, particularly on Liberty’s left hand and leg, head and skirt lines and on the eagle’s breast and leg feathers. 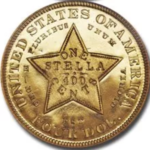 Sharply struck coins often command substantial premiums. In an attempt to improve the striking characteristics of the design, some minor modifications were made by Chief Engraver George T. Morgan in 1918 and again by Assistant Engraver John R. Sinnock in 1937 and 1938. None of the revisions seemed to help, as even later issues are often weak in the central parts of the design. Places to check for wear include Liberty’s head, breast, arms and left leg and the breast, leg and forward wing of the eagle. A full set consists of 65 different date-and-mint combinations but is attempted and completed by many collectors. Although Walkers were not saved in any quantity by the public, particularly in the Depression years, professional numismatists like Wayte Raymond and others put away many early rolls during the `30s. Uncirculated specimens of certain dates in the `10s and `20s are probably only available today due to the foresight of these astute dealers. 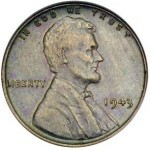 Later-date Walkers also have a strong following: many collectors assemble “short sets” from 1934 to 1947 or 1941 to `47. Type collectors just seek a single, high-grade example. The Franklin half dollar succeeded the Walker in 1948. 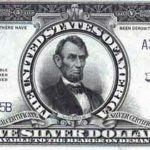 But 38 years later, in 1986, Uncle Sam dusted off the Weinman design for the obverse of the 1-ounce American Eagle silver bullion coin, which has been minted yearly ever since.